Whether it is your time, talent or treasure, your support will assist us in recruiting, training and maintaining the dedicated volunteer base necessary if we are going to meet the needs of the growing number under-served individuals in our communities. A gift of $7 underwrites two trips to Physical Therapy in Akron for an individual recovering from knee surgery. A gift of $10 underwrites a trip to the grocery store so proper nutrition can keep our elderly neighbors healthy. A gift of $18 underwrites one trip to Roswell Park Memorial Hospital for chemotherapy. A gift of $22 underwrites a month's worth of trips for medication level blood work. A gift of $82 underwrites four trips to Orchard Park for Occupational Therapy for an individual with Multiple Sclerosis. 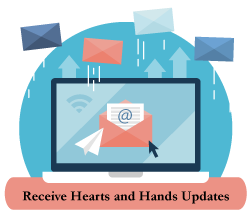 Tax deductible charitable contributions to Hearts and Hands can be made safely online. Volunteering made easy! YOU decide when you are available and what types of services you are willing to perform. Help a neighbor and put your time, talents and treasures back into your community today! Members of the interfaith community interested in joining our mission by encouraging their constituents to support activities designed to help Hearts and Hands recruit volunteers, identify individuals in need and grow the financial means to do the same.